Hope you had a Happy Easter! We took Winston to a local pet store to grab some things and we didn’t realize they were having an Easter egg hunt for dogs! Winston found them all but we only let him have one ? Okay so I need to talk to you about these waffles. They’re really the best waffles ever because they’re the lightest and most crispy waffles you will ever have. Yes, there are some special ingredients for them but it’s nothing that Amazon doesn’t have. I promise you that you won’t regret buying them and I promise you that you won’t want to make waffles any other way again. We found this recipe through ChefSteps and we’ve tried numerous recipes from them with 100% success and satisfaction each time. If you aren’t a fan of measuring/weighing out the dry mixture of this each time, make a huge batch and put it in a large canister or jar and scoop from it each time you’re craving these light as air waffles. You’ll be able to see in the last photograph how incredibly light they are from all the air pockets. I also highly recommend getting a good Belgian waffle maker. We got this one and it was absolutely one of our favorite purchases. I packed it up in storage already (thinking we were going to be moving soon) and I need to go get it out. 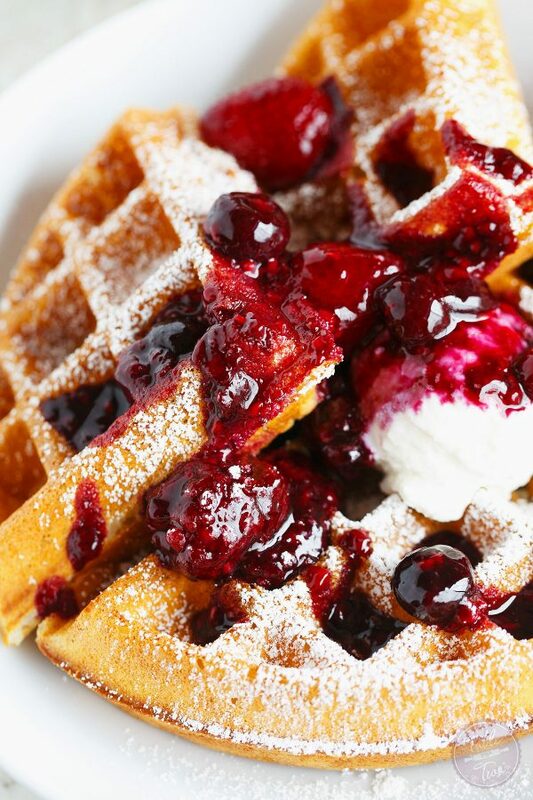 The beauty of plain waffles is that you can top it with whatever your heart desires. 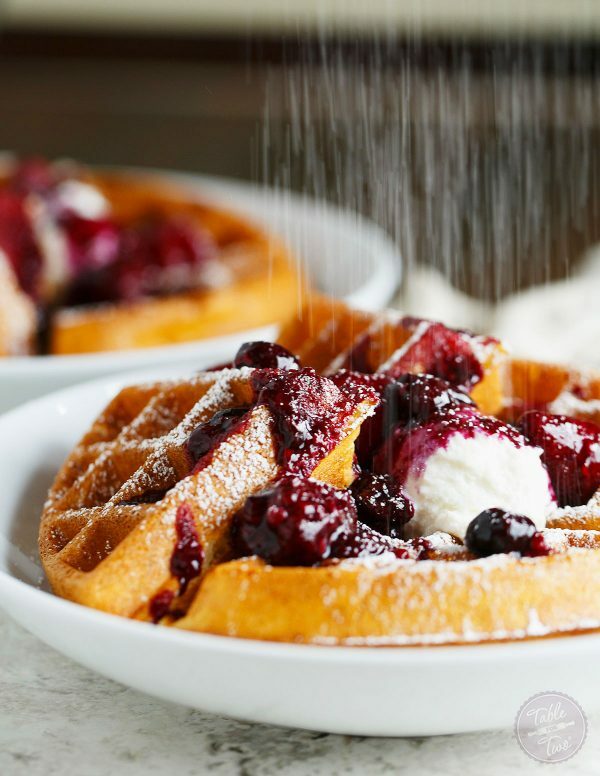 We topped this waffle with a berry compote, ricotta, and powdered sugar. The berry compote was simply made from frozen berries and a tablespoon of water. Super simple and makes a delicious, fruity topping! The air pockets are incredible, right?! Have I convinced you yet? 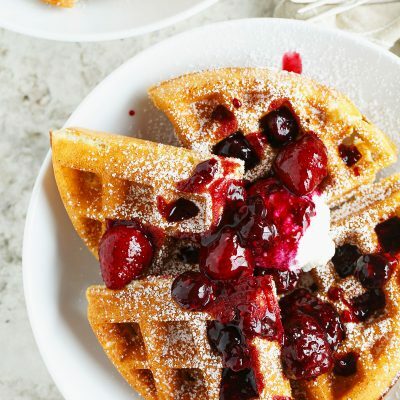 You'll never make waffles any other way again after you've tried these yeasted berry waffles. Sift together all the dry ingredients in a large bowl: flour, malt powder, sugar, salt, baking soda, and yeast. In a small pot over low heat, melt butter and milk together and bring the temperature of the mixture to about 104 degrees Fahrenheit, or under 113 degrees Fahrenheit. This is to ensure you wake up the yeast but not kill it. When the milk-butter mixture is at the right temperature, add the eggs and whisk together. Make a well in the center of the dry ingredients and use a whisk to mix everything together. Allow this mixture to sit at room temp or warmer to allow the yeast to bloom. You can let this sit for as little as ten minutes, or up to two hours. The longer you let it sit, the richer and the more yeasty flavor you'll develop; and the more AIR POCKETS your waffles will have which means LIGHT and CRISPY! We let ours sit for 2 hours. 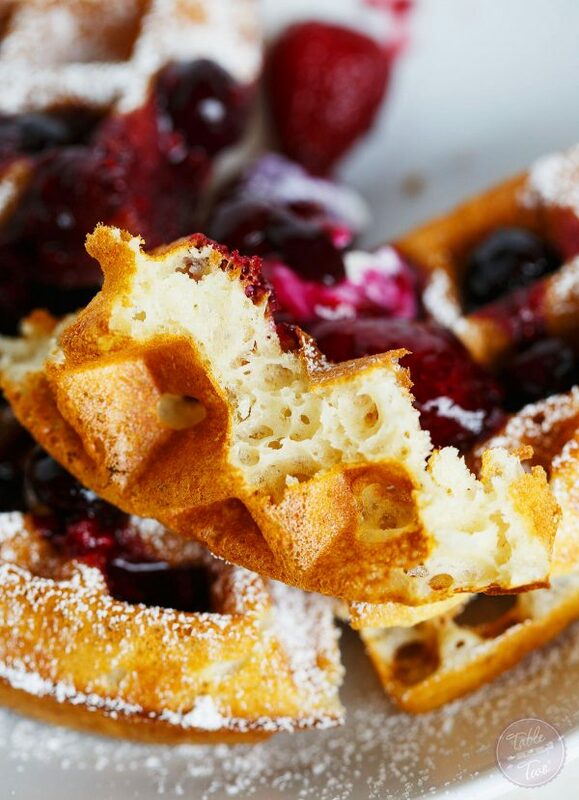 Once the mixture has proofed, heat up your nonstick waffle maker and get to wafflin'! When cooking your waffles, look for a nice, golden, crispy crust, with a soft and almost custardy-like interior (see my photos in the blog post). 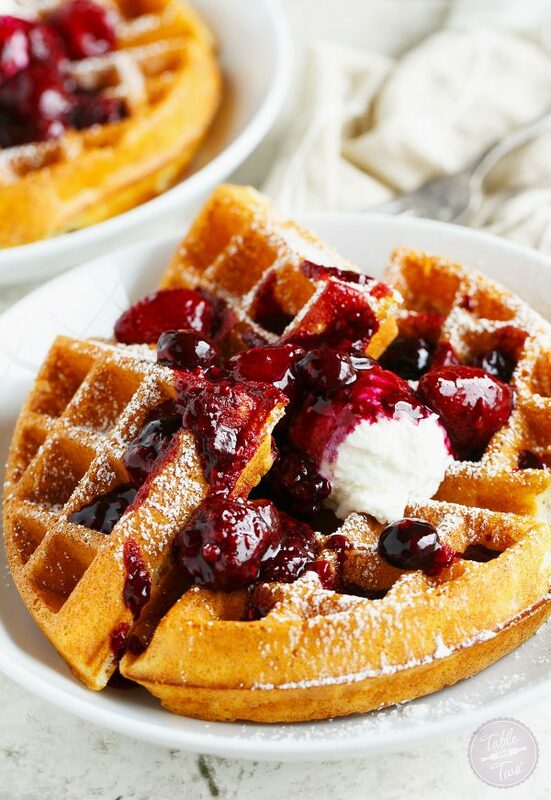 Top your waffles with whatever you like! We topped them with a berry compote (2/3 cup frozen berries, 1 tablespoon of water, bring to low simmer until thick), ricotta cheese, and powdered sugar. I highly encourage you to read the FAQ's for these waffles at the very bottom of the ChefSteps' page. They answer questions that I know you will likely have, such as "do you have to use diastatic malt powder?" - personally, my answer is: yes because it gives the waffle such a light, crispy, texture, and you can use it in other recipes, too. Plus, it is not hard to find at all. You have to weigh the ingredients. It's most accurate in this recipe's case. Here is the kitchen scale I have and use all the time. I want a stack of these right now! Gorgeous photos, friend! 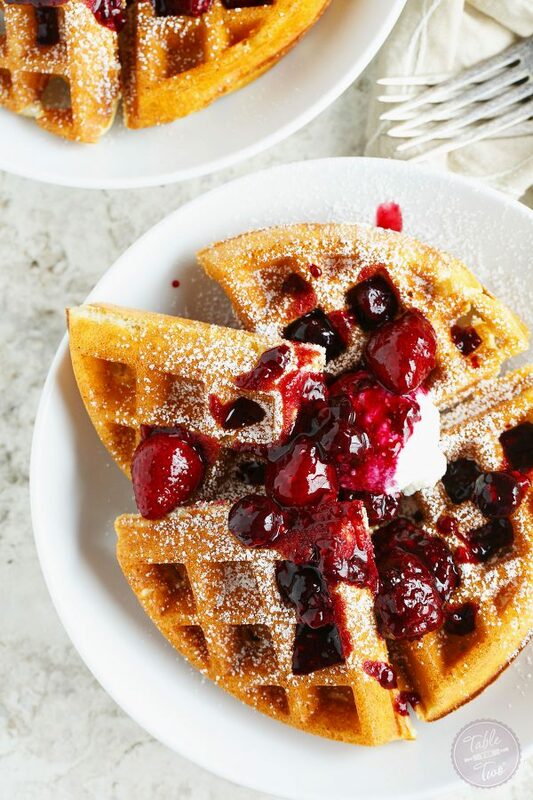 Waffles are always a hit in our house, these sound great! I love a good waffle. My problem is I never make it to plating and saucing. I just eat them as they come out of the waffle iron. I feel like I can practically smell these just reading about them! I’ll take 3, please! Really totally gorgeous Julie! Sending you hugs and thinking of you with everything happening in DC today. Julie!! These are drop dead gorgeous! I can barely wait to try this recipe out. The waffles look amazing. why is this recipe in grams? 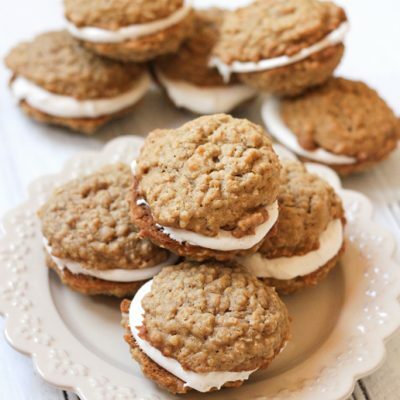 These look mouthwatering! I want to wake up to these in the morning. This is one of the best waffle recipes I have ever made. It’s a Sunday tradition thats been going on for a month. I love that its done by weight, we doubled it last Sunday and its was just wonderful. ( I added a bit of vanilla which was lovely). 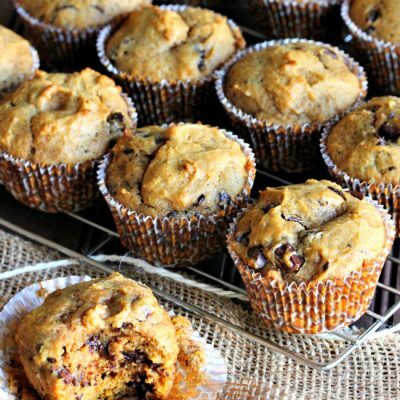 The malt powder makes all the difference so don’t leave it out. Yay! So glad you took the time to make this (and give feedback) – thank you! 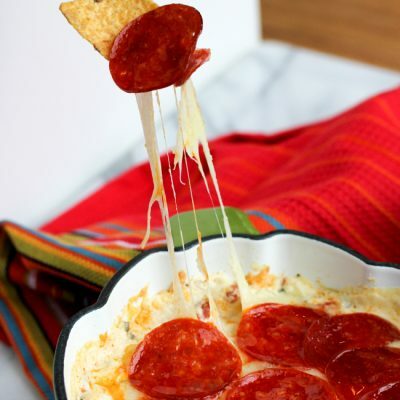 These look awesome but I don’t have a scale so how do I measure these ingredients . Hi, I would suggest maybe putting it into google and seeing if it’ll convert but usually converting from weight to cups will be slightly off.